"And so take heed old warrior and listen up. It shall be done to wrap you in your colors of glory, with sword in hand, to stand watch over God's Kingdom in Heaven and be readied for your last 'call to arms'. You are called upon to offer your final show of honor with a commitment to duty and courage which will forever serve you. Your undying bravery and strong spirit are timeless, and will endure the ages forever more, as the true warrior that you are." These classic Military Caskets are now being presented to the Veteran Community in recognition of and with respect for their service. 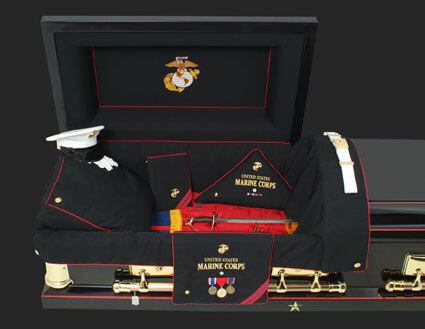 Since the very inception of our military, there has never before been authentic military burial products. They are needed by our service men and women at the time of their passing. The Veterans with whom I have had the pleasure of speaking have all expressed the same feeling, "It's about time we had our own Casket, Urn, and Cross, with the opportunity to present ourselves with personalization as to who we really are". It is appropriate for the warriors of our time to be honored with a great deal of pride about how they fought, and survived, and lived their lifetime with us. I am proud to have designed and developed the Vietnam Memorial Stone for my fellow Veterans who sacrificed their lives, and for those who served in the Vietnam War. 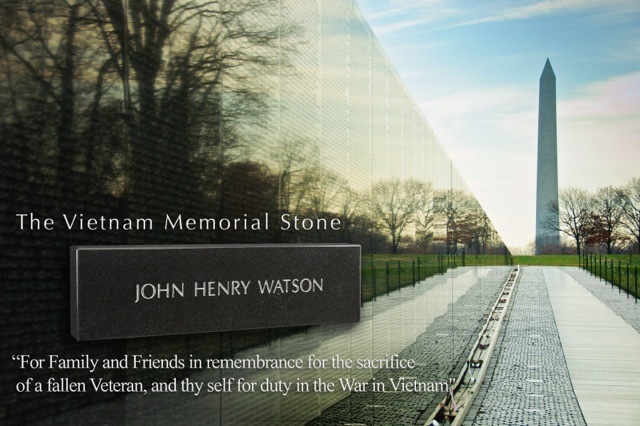 The Stone is offered with the encouragement of Maya Lin, designer of "The Wall". As our fellow Veterans are in burial, so shall we be in cremation. It is especially important to pay tribute, respect, and honor with a monument that encompasses a military service and passion for life. This cremation urn replicates headstones found in Veteran Cemeteries. They are available in White Marble or Gray Granite and are virtually seamless. This urn is unique as it displays the Branch of Service Cap Device and engraved lettering offered in either Gold or Silver. 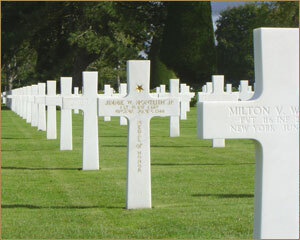 The Military Crosses that are displayed at Normandy and the other overseas cemeteries are now available for all Veterans to purchase. These are the most well known, widely recognized, and respected Military Crosses ever to be created by our country for our Veterans. 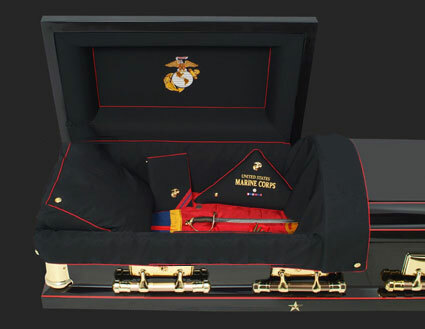 A Military Casket combined with the Cross represents a very strong and powerful statement that gives credibility to the Military Funeral that represents the Honor, Heraldry and Bravery of our men and women Veterans. "The Crosses at Normandy" and the Military Caskets and Urns will be the products of choice for our Veterans for many generations to come. I am proud to present these as the finest quality products of their kind in the world. And now my fellow Veterans, with these military products we can present ourselves as we have lived: with a display of honor, one's own heraldry, and the memory of our military service long ago. With love and respect “From a Grateful Nation”, to all those who served us. Written permission was granted to Jonathan Field in 1996.
for which they are used.